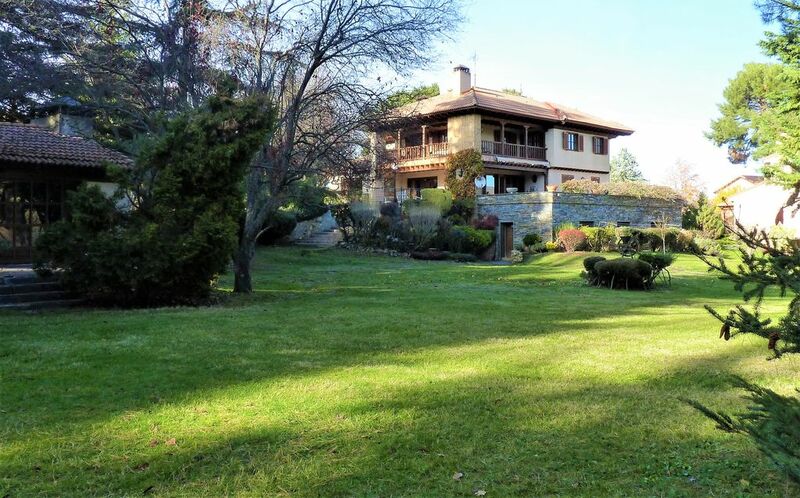 Elegant villa with an enormous garden and impressive views of the Sierra de Ayllón, at a few minutes' walk from the old center of the picturesque town of Riaza and at 10 minutes by car from the La Pinilla skiing slopes. Large villa built on 3 floors. On the ground floor it has: an attractive entrance hall; a large living-dining room with a dining table seating 10, a comfortable sitting room with a large screen tv, and a sitting corner decorated with beautiful old ceramic tiles; a family room with a tv and a sleeping couch; a guest toilet; and a double suite with a double bed and its own full bathroom. On the second floor are 4 double bedrooms, one of which with its own bathroom and another one with 4 beds, as well as a third full bathroom. In front of the living room is an ample terrace facing south, with a dining table for 14 and beautiful views of the large garden and the Sierra de Ayllón. The garden has a fenced full-size tennis court with basket ball baskets, and a barbecue. This wonderful villa belongs to the family of my friend Isabel, who has asked me to manage the rentals for her as I already had experience renting out my own country house in Spain. Art dealer and nature lover, I am of Dutch-German-North-American origin. Very spacious and comfortable house at only 5 minutes on foot from the main square of picturesque Riaza, and at less than 10 km. from the skiing slopes of La Pinilla. The area has a lovely cool climate in summer, with sunny, dry days and cool nights. Casa increible con un jardín espléndido y enorme para disfrutar. Una estancia perfecta con muchísimo espacio con todo lo necesario y un jardín enorme muy bien cuidado con unas vistas espectaculares para disfrutar, los niños encantados con la cancha de baloncesto. Muy recomendable y para repetir. Los dueños majísimos y muy atentos. La situación es perfecta se puede ir andando a la plaza de Riaza todo a mano y en un entorno precioso. This region of Spain, at an hour from Madrid and on the northern slopes of the Guadarrama mountain range, has relatively cool temperatures in summer and easy access to the snowy peaks and skiing slopes of the Sierra de Ayllón in winter. The house us at 10 minutes on foot from the old center of picturesque Riaza, which has several excellent restaurants and all necessary shops. The skiing slopes of La Pinilla are at 9 km. from the house. At 3 km., there is a horse riding school where one can take classes or hire horses for tours on horseback of the country side. Bicycles for rides through the country side can be rented in the town. At around 40 km. from Riaza are the Hoces del Duratón canyons, a breath-taking landscape and perfect for canoeing.